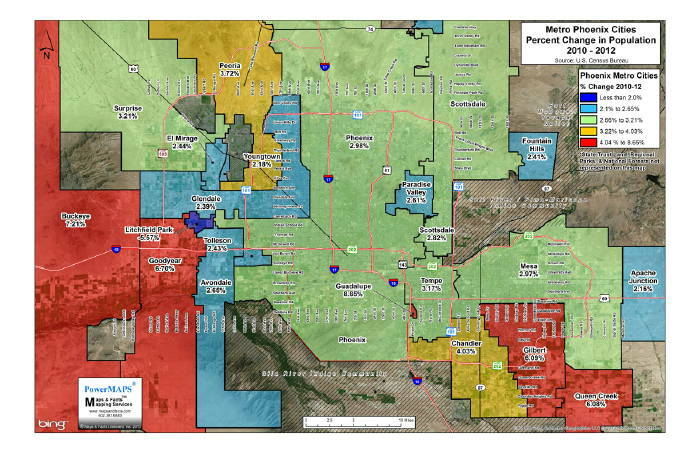 Map Samples - 2013 Maps of the Month - Maps & Facts Unlimited, Inc.
Arizona Ranks 3rd in Net Migration! This month's map shows net migration from 2010 to 2012. As shown, Arizona ranks 3rd among all Western States (red outline). Of interest, Washington D.C. ranked 1st in the nation. North Dakota was nationally 2nd due to the petroleum & natural gas fracking boom. Florida and Texas were next, but look at their base population counts. Compared with our peers, we are doing well! California didn�t even exceed 0.50%. Michigan and Illinois were both negative. 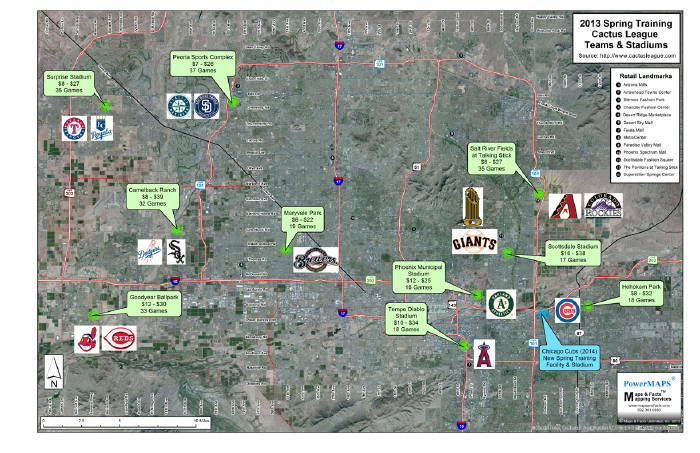 This concentration of spring training sites attracts millions of tourist dollars but also provides for year round use by junior leagues, tournaments, baseball camps, and regional competitions. The stadiums also attract and support hotels, restaurants, and retail in their respective sub-markets. Since the Diamondbacks take pride in having the lowest ticket prices in Major League Baseball, we've added the ticket price ranges for each Spring Training Stadium. 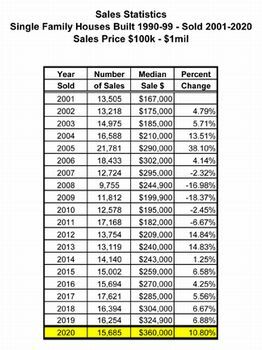 In our opinion, the recent excitement about housing prices increasing 20%, 30%, and even 50%, while probably accurate for what they portray, are misleading because they don't portray the "average" house. 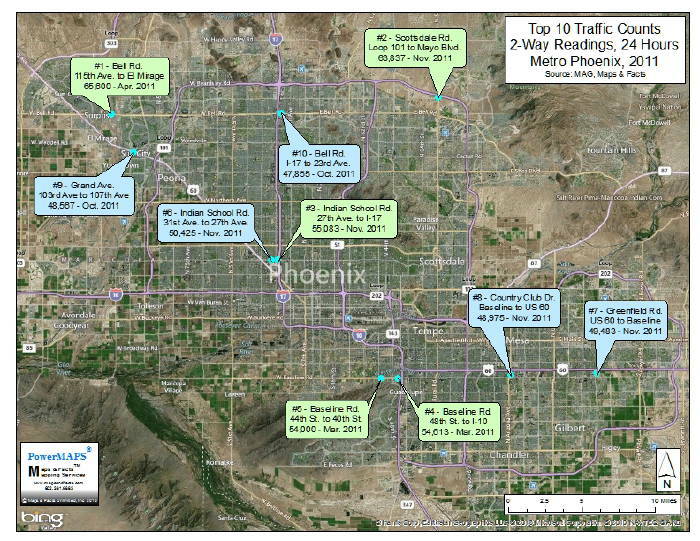 This month's map shows the 10 busiest non-freeway road sections in Metro Phoenix in 2011. Not surprisingly, 6 of the 10 access freeway interchanges and include freeway traffic as well as through traffic. Indian School Road seems to have kept its reputation of the most congested East/West arterial streets. There has been much recent press about population and job growth leading our economic recovery; however, it�s hard to put into perspective without a map and closer examination! 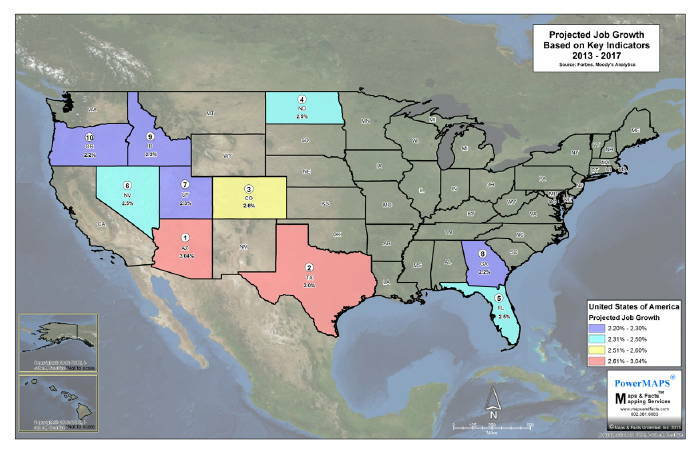 This month�s map depicts where the percentage growth was and probably will be for the next decade. 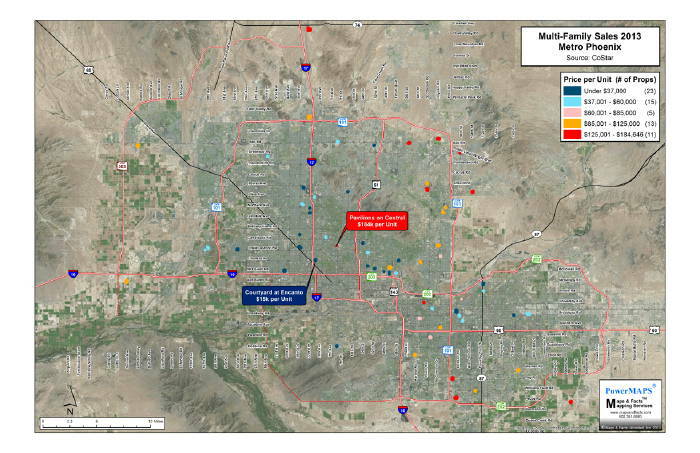 As shown, growth is concentrated in the far west I-10 corridor, and, the far Southeast Valley. Rather than pinpoint one quarter or even one year, we combined 2010 which was a true census (taken in 2009) with 2012 which was and always will be an estimate. 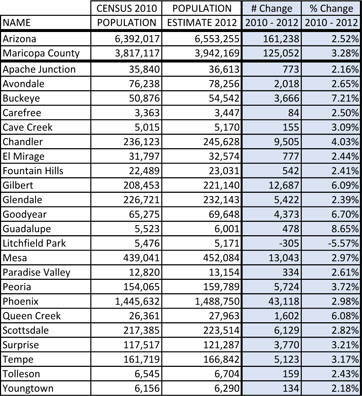 However, as the below chart summarizes, the greatest number of �new� residents by far was in the City of Phoenix with 43,118 added. 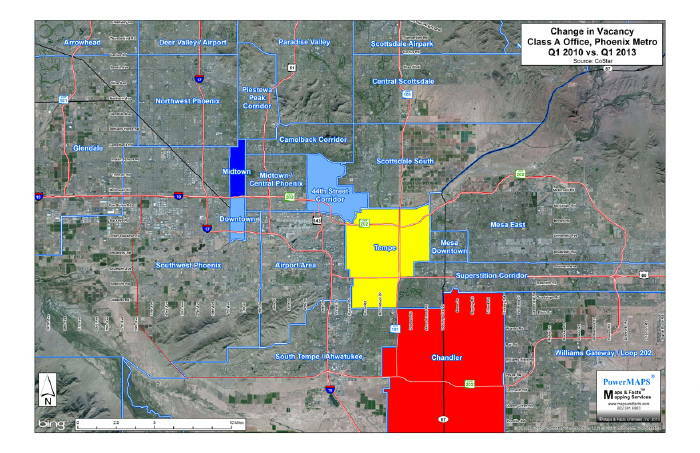 Mesa and Gilbert were second and third numerically but with only 13,043 and 12,687 new residents respectively. And beware, all population estimates include births over deaths which is less volatile than net in-migration. Using Costar�s submarket data, we have compared vacancy rates from the first quarter 2010 low point with first quarter 2013. The first quarter 2010 vacancy rate was 23.32%: first quarter 2013 was 20%. While quarter to quarter is not controlling, valley-wide, the overall Class �A� office vacancy rate has declined only slightly; but each submarket is dramatically different. 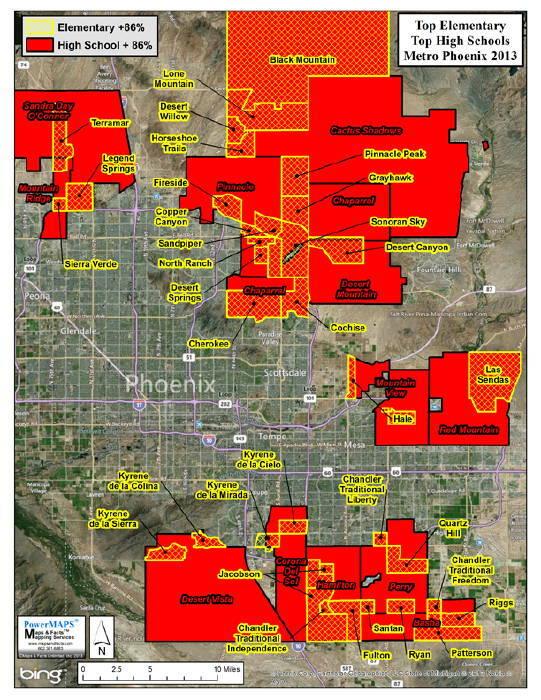 Looking at the larger submarkets only, Tempe and Chandler showed the greatest improvement going from 42.10% to 12.20%, and, 36.3% to 3.90% respectively. Downtown went from 22.40% to 12.80%. The 44th Street corridor went from 25% to 10.20%. We should expect near term rent increases in these sub-markets, but we still need to have significant rent and occupancy increases to justify new construction (cost equals value). There has been much press lately about the shrinking supply of houses for sale and rising house prices. 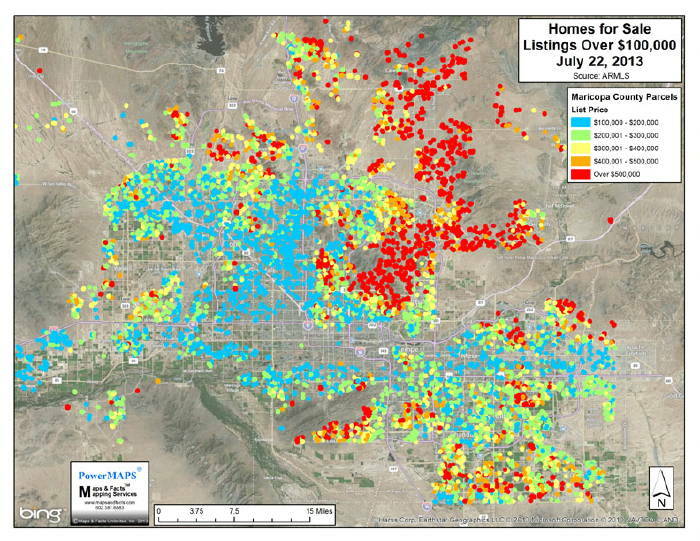 While no doubt there are fewer houses for sale today, as shown, we still have many choices, in many price ranges, in virtually all parts of The Valley. At some point the market will equalize and the number of new listings will approximate the number of sales, expirations, off markets, and old listings. Apartments: Another Proxy for Submarkets? We have long argued that grade school test performance is a proxy for other real estate metrics. Another may be apartment values. The apartment market is still on fire, but geographic differences may be a clue to broader submarket demographics. This month�s map depicts 67 �one-off� apartment sales, per CoStar, since January. Unit prices ranged from $15,000 to $184,000 per unit; a wide range to say the least. Obviously; amenities, location, and condition help explain these wide differences: and, with the exception of the Pavilion on Central, the 11 other projects over $125,000 per unit are located on the urban �fringe�. 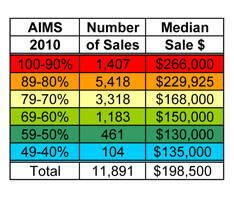 Based on this sample, high end apartments may be another proxy for real estate metrics. As economist Lee McPheters with ASU has long told us, Arizona has always been among the Top 3 growth states for the past 40+ years. This month�s map shows that Arizona is projected to regain the top job growth spot over the next 5 years. Also shown, are the next nine (9) states dominated by the Mountain West. While most leading economic indicators are still well below past peaks, Arizona is coming back: cautiously strong! 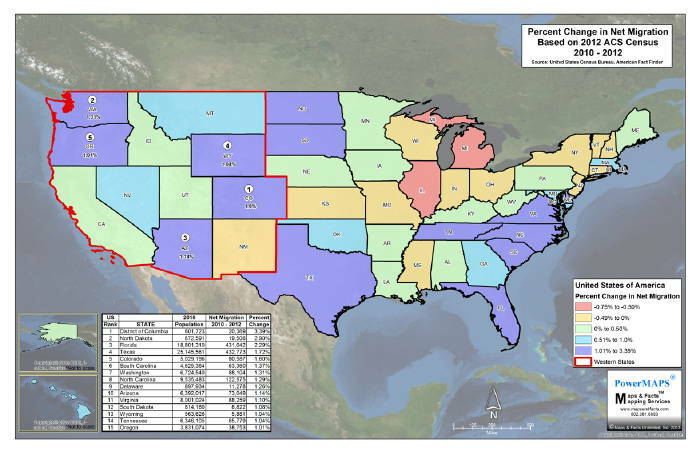 This month�s map identifies all elementary and high schools in which 86% or more of the students taking last year�s AIMS test achieved or exceeded the standard as established by the State. I.e. : all the elementary schools identified by a yellow border are also located in a top high school district as outlined in red. AIMS tests are just one measure of school performance. Obviously, there were other elementary and high schools that also scored 86% or higher; just not with overlapping geography. And, there are many other criteria to evaluate school performance as well. 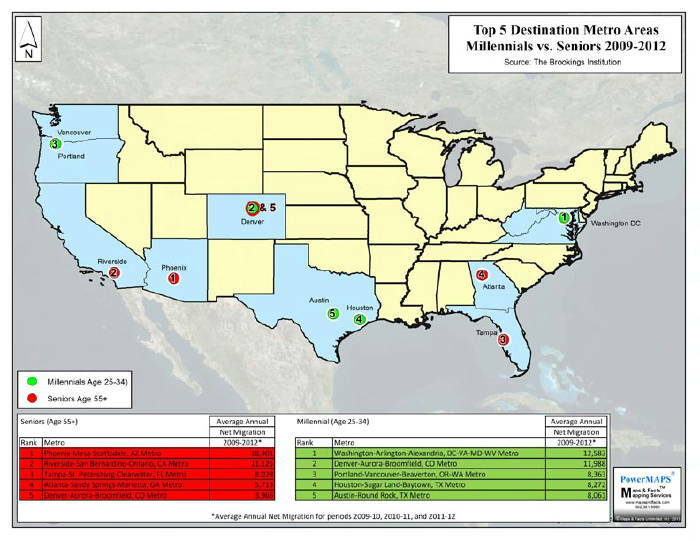 Senior vs. Millennial Destination Metro Areas! Newly released census data tracking Senior and Millennial migration from 2009 through 2012 offers two dramatic, and perhaps long term, trends (link). This month�s map compares the top 5 metro areas for Senior vs. Millennial net migration. Green is a top 5 Millennial metro area; red is top 5 Senior metro area. In contrast, Metro Phoenix didn�t even rank in the top 20 in attracting Millennials. Denver ranked high (no pun intended) in both categories. Metro Phoenix has to become more Millennial friendly if we are to attract and retain younger households at the time in their lives when they can and do make lifelong lifestyle choices. Listings Up - Sales Down! According to most housing experts, the number of active single family listings (ARMLS) has been increasing (25,000 vs. 15,000 to 20,000),and demand has been decreasing (higher prices, affordability, and interest rates), suggesting that single family supply and demand are near equilibrium. 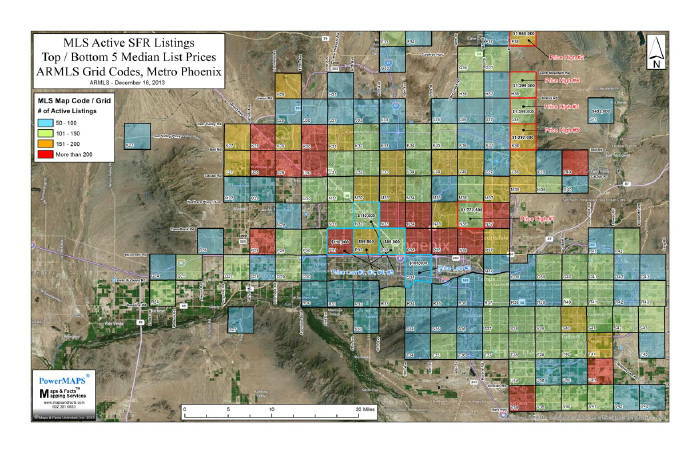 For the real estate practitioner, it is difficult to analyze county wide data at the neighborhood level. Where are the 25,000 listings? What are their price levels? GIS allows us to drill down to the neighborhood level. While the number of listings per grid is a starting point, one must also consider density and housing type. A high number of listings in one grid may be a function of density and build out rather than supply. I.e. Sun City. It will be interesting to see how this plays out in 2014! Attached to the map is a spreadsheet detailing listing counts and median list prices for all the grids shown.